Still under contract with Lo Wei, Jackie Chan was finally given full creative control on a film and here is the result: an early hint at the slapstick potential of the kung fu comedy sub-genre. Chan uses his new found freedom to clown about in his own imitable fashion (less Bruce Lee and more Charlie Chaplin), throwing comedic punches at the stifling pictures he was being forced to make at the time, and the more earnest traits of chopsocky cinema. Like most formative processes, the film is far from polished, and Chan is still honing the happy-go-lucky persona which would later make him such a huge international star. The film drags in places, particularly when Lo Wei’s authoritative influence starts to creep in; notably a routine story involving the treacherous transportation of sacred treasures with names like the ‘Evergreen Jade’ and the ‘Soul Pill’. 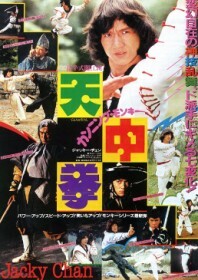 Lo Wei detested the film and shelved the project, only to release it later to huge success once Jackie Chan had become a major hit at the box office.